Senator John McCain, an American hero, dies at the age of 81 after a battle with brain cancer. US and Mexico reach a trade deal: The deal includes several provisions to alter a pact Mr. Trump has long branded “a disaster” for what he considers incentives encouraging U.S. companies to shift production to Mexico. The most significant is a clause that would boost the percentage of autos that would need to be made in North America to qualify for the tariff-free cross-border trade allowed by Nafta. It would also require a certain portion of cars to be made by high-wage workers—a response to longstanding U.S. union complaints over low-wage Mexican labor. A debate over whether the market will or won’t crash if Trump is impeached? : some people have said the market will go up if Trump is impeached. I can’t envision the market going up in that scenario since it adds a lot of uncertainty which the markets usually don’t like. 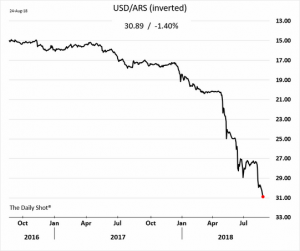 Argentina lifts interest rates to 60%, the highest in the world: Argentina recently increased interest rates by 15% in an attempt to defend their currency which has fallen by 50% this year. 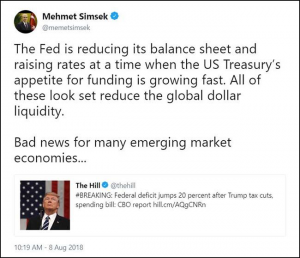 Turkey moves to stave off financial crisis: Turkey’s currency is in free-fall (along with other emerging markets) and refuses to give into Trump’s demands to release a US pastor being held in jail. Trump to potentially back $200B China Tarrifs: The jury is still out on what’s going to happen here but threats are still being made, even when a lot of US companies are begging the President not to pull the trigger on these threats. Elon Musk tweets about taking Tesla private with the help of Saudi Arabia. Then receives subpoena from the SEC. Chairman Powell provided the kickoff address to the Kansas City Fed’s annual Jackson Hole symposium, broadly attended by many of the world’s central bankers. 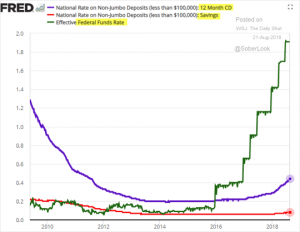 Powell’s light treatment of policy issues was normal for Jackson Hole, where the discussions typically focus on the conceptual framework that drives monetary policy decisions. The more interesting part was Powell revealing his own discomfort with the current policy framework. By analogy, Powell said the current employment/inflation policy paradigm is comparable to navigating by the stars with inferior instruments. The data lacks precision and also moves over time. This is another way of saying the Fed’s economic models don’t work. Others have observed this, but it is significant for the chair to both say it and propose an explanation why. The answer, said Powell, is for the Fed to focus on risk management: go slowly, be observant, and be prepared to act. For this months version of My 2 Cents, I’m going to include an abridged quote from Jesse Felder from The Felder Report since I believe he does a good job of explaining his views of the stock market which I agree with. As I’ve said many times, risk management is critical when we’re in a late stage economic cycle (which I believe we’re currently in). 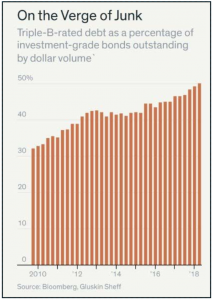 “…Price-insensitive buying on the part of passive investors, central banks and corporations themselves have been the primary demand drivers of equities in recent years. For equity valuations to avoid reverting closer to a historical average these will be required to at least maintain their current pace of buying. Most importantly, record corporate stock buyback activity will be required to continue to make up for the demographic headwind to equity valuations. The question of, “Who will baby boomers have to sell to?” is about more than just real estate. It’s also about equities. The Fed has estimated that over the coming years demographic trends could mean the stock market reverts to a price-to-earnings ratio of 8 versus 24 today. Without record stock buyback activity or radical central bank intervention this outcome becomes a near certainty. 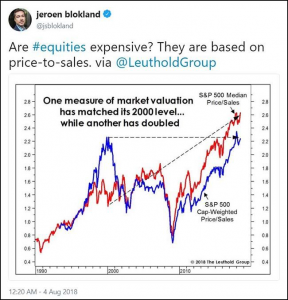 Thus there is another perfect scenario embedded in today’s equity valuations, that the current price-insensitive demand will continue indefinitely. Finally, there is a third embedded assumption in today’s stock prices that may present the most poignant risk at present. This is the assumption that record corporate profit margins, enabled by record low labor share, will also be maintained indefinitely. What most investors don’t understand today is that the price-to-earnings ratios they use to value any stock in the market at all are entirely reliant on sustaining margins at levels that have been historically unsustainable. Again, this assumption has already been discounted by the market. Think of it this way: As mentioned above, the current price-to-earnings ratio of the S&P 500 is roughly 24 versus a historical average of about 15. However, should profit margins revert to a more normal historical level that valuation could soar to 35 or 50 times earnings as the denominator falls. In this scenario there is not only the potential risk of a reversion in valuations but also a reversion in profit margins at the same time, a scenario that would be doubly painful for equity investors paying current prices. Thus the premium embedded into today’s stock market also assumes profit margins will avoid reverting to historical averages. 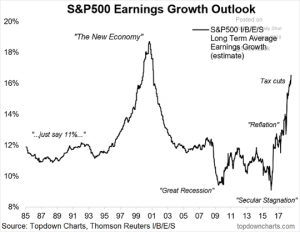 Some similarity in long term earnings growth projections to the dot-com era. The Turkish lira has lost more than 40% against the US dollar this year. The lira’s plunge has also spread to other emerging market currencies—the South African rand, Argentine peso, Russian rouble, and Indian rupee. Turkey’s currency crisis has mostly spooked emerging market investors, but the developed markets aren’t out of the woods just yet. Turkey has hundreds of billions of external debt denominated in dollars and euros that is now way more expensive to repay. 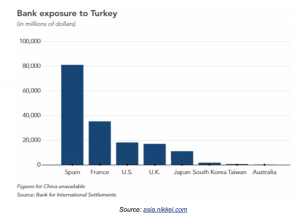 The European banking sector has the most exposure to Turkey. 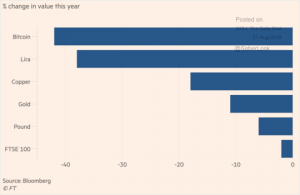 The Bank of Japan (BOJ) is trying to shift away from its massive asset-buying stimulus programs that have distorted its markets. The BOJ owns about 74% of the country’s entire ETF market. It holds more than a 10% stake in 27 Japanese listed companies. The BOJ recently adopted a yield curve control policy that lets it scale back bond purchases to roughly half of what was loosely pledged. It now buys just enough bonds to keep yields pinned near zero. Japanese market strategist also think the BOJ could be pursuing a stealth tapering of its equity purchases. The central bank kept its ETF purchase target at 6 trillion yen ($54 billion) annually at its July meeting, but said volume would depend on market conditions. 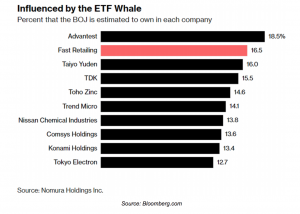 If the central bank’s bond purchases are any guide to how it proceeds with ETFs, less buying from the “Tokyo Whale” could send shivers through Japan’s equity markets. 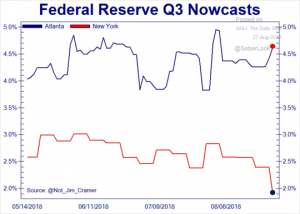 The New York and Atlanta Fed GDP models are diverging quite a bit. It’s amazing how policy makers which affect interest rates have such different models for how they think Q3 GDP will turn out. Doesn’t give you much faith in their predictions. 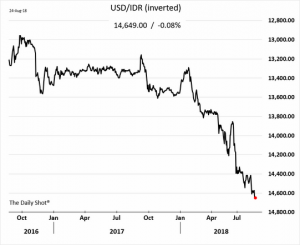 Indonesian Rupee has fallen quite a bit since the year started. 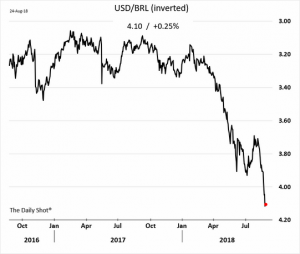 The Brazilian Real has dropped considerably as well. As I’ve mentioned in past updates, emerging markets are experiencing a currency crisis. The last time there was an emerging market currency crisis, it took down Long Term Capital Management. Here’s the Argentina Peso which is in free-fall. 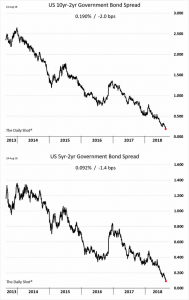 The yield curve continues to flatten in the US. As of the day this chart was taken, the difference between a 2 year and 30 year US treasury bond was less than .20%! That’s a lot of duration risk for little reward. 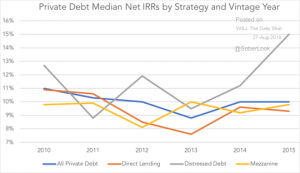 Private debt has become very popular as of late with new business development companies (BDC’s) launching each week. The space is starting to get more crowded and we’re seeing yields compress further even though downside risks have increased. It’s hard having a lot of cash in a bank account or even savings accounts when you’re able to buy into money market funds with yields anywhere from 1.8-1.95% on average. Bitcoin is leading the way in YTD declines just ahead of the Turkish Lira. The deficit in the US is set to increase with the recent tax cuts. 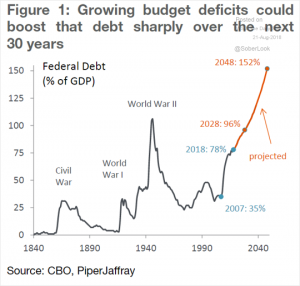 To fund them, the US will have to issue debt pushing the debt:GDP ratio higher. 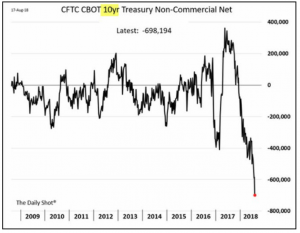 Are you short the 10 year treasury bond? Everyone else is. 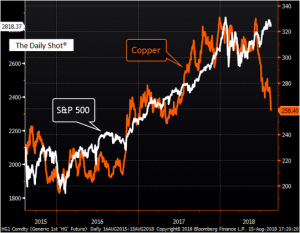 Dr. Copper says there’s downside risk to the S&P 500. I hope you enjoyed this months financial markets update. If you have any questions please contact us directly. If you’re interested in a topic that you’d like us to address, please email us so we can include them in future updates. If you’re interested in starting a dialogue and learning how we can help, please click the link below to book a call or meeting with us. Proper Wealth Management’s (“Proper”) blog is not an offering for any investment. It represents only the opinions of Jared Toren and Proper . Any views expressed are provided for information purposes only and should not be construed in any way as an offer, an endorsement, or inducement to invest. Jared Toren is the CEO of Proper, a Texas based Registered Investment Advisor. All material presented herein is believed to be reliable but we cannot attest to its accuracy. Opinions expressed in these reports may change without prior notice. Information contained herein is believed to be accurate, but cannot be guaranteed. This material is based on information that is considered to be reliable, but Proper and its related entities make this information available on an “as is” basis and make no warranties, express or implied regarding the accuracy or completeness of the information contained herein, for any particular purpose. Proper will not be liable to you or anyone else for any loss or injury resulting directly or indirectly from the use of the information contained in this newsletter caused in whole or in part by its negligence in compiling, interpreting, reporting or delivering the content in this newsletter. Opinions represented are not intended as an offer or solicitation with respect to the purchase or sale of any security or financial instrument, nor is it advice or a recommendation to enter into any transaction. The material contained herein is subject to change without notice. Statements in this material should not be considered investment advice. Employees and/or clients of Proper may have a position in the securities mentioned. This publication has been prepared without taking into account your objectives, financial situation or needs. Before acting on this information, you should consider its appropriateness having regard to your objectives, financial situation or needs. Proper Wealth Management is not responsible for any errors or omissions or for results obtained from the use of this information. Nothing contained in this material is intended to constitute legal, tax, securities, financial or investment advice, nor an opinion regarding the appropriateness of any investment. The general information contained in this material should not be acted upon without obtaining specific legal, tax or investment advice from a licensed professional. Jared Toren is CEO and Founder at Proper Wealth Management. Proper was born out of frustration with the inherent conflicts of interest at big brokerage firms influencing advisors to sell products that were not suitable for clients but profitable to the firm along with a consistently mixed message of who’s interest was supposed to be put first; the clients’, the firms’, shareholders or advisors. At Proper, our clients interests come first. We are compensated the same regardless of which investments we utilize so there’s no incentive for us to sell high commission products. Since we focus on a small number of clients, we are able to truly tailor our advice to each person’s unique circumstances. Proper Wealth Management Proper Wealth Management is a boutique wealth management and investment advisory firm providing dynamic strategies by design. Click here to schedule an appointment with us.